1. The example for 3(3)(E) in the side-by-side document discusses the partitioning of objects and the fraction as a concept of division, not a numerical representation. The goal would be that a student realizes that each student would receive five half-pieces of cookie. With this basis, students can the develop improper fractions and mixed numbers in grade 4. If I look at the phrase “solve problems” I’m led to believe I’ll get a numerical answer like I get when I solve other math problems. Yet I think he’s focusing on the phrase “pictorial representations” to say that their answer is meant to be less formal. All in all, I feel students can solve problems like sharing five cookies among 2 people, but the avoidance of 5/2 as an answer leaves me scratching my head. What purpose does it serve? 2. Much like with 3(3)(E), the focus of [3(7)(A)] is the division of the line segment. In the given example, the mark is ¼ of the distance between the numbers 16 and 17 on the number line. This is some shady logic. The standards don’t ever mention mixed numbers in any elementary grades, but apparently they are implying that because a mixed number is composed of a whole number (3rd graders should be comfortable with those by now) and a fraction less than one (introduced in grade 3), they are fair game. I’m not against this interpretation. What I don’t like is the vague language that leaves it open to interpretation in the first place. I feel like I need to hire a lawyer to help me make sure I’m interpreting the language of these standards accurately! 3. You are correct; the last stand-alone measurement standard is 2(9)(D). However, students can be asked to measure the side lengths of a polygon in 3(7)(B).With the process code of 3(1)(A), a ruler could stand in for a number line in 3(7)(A). 4. Please remember that the Texas Essential Knowledge and Skills are minimum standards and are not intended to limit what is taught. It’s the “Get Out of Jail Free” card. I don’t think the issue is that teachers are scared of teaching beyond the standards. The problem is teachers trying to get a good grasp of what the bare minimum is in the first place. After reading through the TEKS, which are technically the standards, teachers can walk away thinking they know where the bar is. However, based on supplemental documents and email clarifications, the bar seems to be in a state of flux, leaving teachers unsure of how high their students need to jump. This doesn’t seem like a fair position to put teachers (or their students!) in. I blame the TEKS formy headache today. Specifically the grade 3 TEKS. They are not on my good side right now. To give you some background, for the past few years I designed curriculum based on the Common Core Standards. I’ve also designed materials for Texas, but lately it was kind of secondary to the Common Core stuff. I’ve grown to love the Common Core standards. There is a lot of thought and care into the progression of topics from grade to grade. They aren’t perfect, but I value how much they do make sense, especially if you read the accompanying progressions documents. Several years ago, Texas decided to write some new math standards. They didn’t want to adopt Common Core…because Texas…but it was clear the writing team appreciated those standards, too. The first draft of the new Texas standards had so much Common Core language in them, they may as well have been the Common Core. But then the Texas standards went through a round of revisions and what came back looked like someone had hacked off pieces of the Common Core standards, shuffled them around a bit, and called the final product new Texas standards. Needless to say, I’ve been unimpressed. However, in my new job, I am working squarely in a Texas district in the state of Texas so the Texas standards (TEKS for short) are my focus from here on out. Lord help me. Ok. I can handle that. But what’s this grade 2 standard over here say? Weird. Let’s introduce an idea in grade 2, completely skip it for a year in grade 3, and come back to it in grade 4. Well, at least that’s settled…I think. Examples of problems include situations such as 2 children sharing 5 cookies. I can buy students solving this problem. That’s fine, but how do you rationalize the answer? You are either going to end up with 5/2 which contradicts the rigidity of 3.3A and 3.3B, or you’re going to end up with 2 ½ which is a mixed number. By the way, did I mention the term mixed number doesn’t appear in the TEKS at all across grades K-5? At all. Can you see why this might make my head hurt a bit? My guess is that they are cheating a bit in their interpretation of 3.3A and 3.3B. By having students use mixed numbers, they are really only writing a whole number combined with a fraction less than one. Do you get it? The number 2 ½ doesn’t break their rule because the fractional part is less than 1. Old 3.10 The student is expected to locate and name points on a number line using whole numbers and fractions, including halves and fourths. On this year’s high stake test (STAAR), the students had to locate the mixed number 16 1/4 on a number line. Do you think they would ask the same thing based on the wording of the new TEK? I sure can! 5.4H represent and solve problems related to perimeter and/or area and related to volume. Because fluency with the addition and subtraction of positive rational numbers is expected within the Revised TEKS (2012), lengths may reflect fractional measures with perimeter. So the wording of the standards themselves never brings up fractional measures in grades K-5. The only way you would even know this grade 5 standard uses fractional measures is if you happen to cross reference it in the Side-By-Side document which is available on a completely different website from the standards themselves. I’m not even sure they’re available on the Texas Education Agency website. Can you see why I had a headache today? I did email someone at TEA today to request clarification. I can’t imagine I’m the only person who finds these particular standards unclear and confusing. If I hear back, I’ll be sure to share! I don’t want anyone, teachers or students, to suffer as I did today. This entry was posted in Uncategorized and tagged confusion, fractions, measurement, side-by-side, TEKS on August 25, 2014 by bstockus. It’s hard to believe that in 3 days I’ll have been at my new job for a month! I can’t remember if I posted about it already or not, but I left my position at McGraw-Hill Education to become the lead curriculum specialist for elementary math at my old school district. By the way, my job title is a mouth full and I feel pretentious every time I have to tell it to people. I’ve tried finding ways to shorten it, but it just doesn’t work. If I say I’m a curriculum specialist, then it sounds like I do it all. While technically I can do it all as an elementary teacher, I don’t do it all now. And I can’t just say I work in elementary math because that doesn’t really feel very descriptive. Oh well. As far as problems go, I can live with this one. Time has flown by, mostly because I’ve been so busy. I’ve been enjoying meeting lots and lots of new people and learning the ropes. My first big hurdles on the job relate to our new textbook adoption. In the spring, our district adopted a curriculum called Stepping Stones. It’s by a company called Origo. It’s a digital curriculum, meaning there is no printed book for the teachers. All of the lesson plans are online. After a week or so on the job, I was tasked with compiling a list of all the elementary teachers in the district who teach math so we could create their online accounts. Basically we don’t want to spend money buying content licenses for teachers who aren’t going to use the curriculum at all. Making a list sounds easy, right? Just contact HR and get one from them. Yes? Maybe? No, not so much. HR was able to give me an initial list, but it took communicating with Assistant Principals at our 33 elementary schools and making lots of edits to a spreadsheet to finally nail it down. The next big hurdle was putting on implementation training for about 1,200 teachers spread out at 6 campuses across the district. Thankfully I have a wonderful partner in crime on my team who knows the district inside and out. She was invaluable in getting everything organized and ready to go. The trainings took place last Wednesday, and all in all, they went amazingly well. Yay! With those two big tasks under my belt, I’ve moved on to an ever growing to-do list. Currently we’re wrapping up the curriculum documents for the second nine weeks for grades K-5. Then we have to write second semester timelines and unit guides which haven’t even been started yet. We also have Curriculum Based Assessments (fancy name for benchmark exams) to prepare, a department website to update, and preparations to make for upcoming trainings we’re doing with our interventionists. Whew! Good thing I like what I do. This entry was posted in Uncategorized and tagged curriculum, district, elementary math, Origo, Stepping Stones on August 25, 2014 by bstockus. 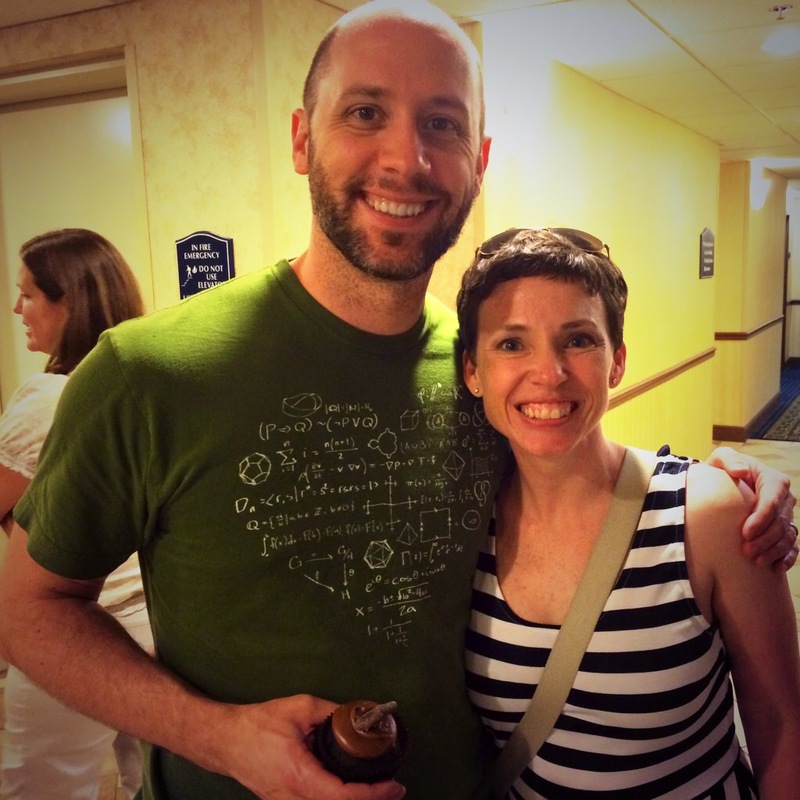 After joining the Mathtwitterblogosphere two years ago, I finally got to attend Twitter Math Camp. Yay! Meg is my TMC Bookend Buddy because we hung out together at the start and end of the conference. In case you aren’t aware, Twitter Math Camp is a grassroots, “for teachers, by teachers” conference put on by fellow math educators from the US, Canada, and the UK. This year the conference was hosted by Jenks High School in Jenks, Oklahoma. (Thank you, @druinok!) There is no cost to attend and none of the presenters/facilitators are paid. This is very much a DIY conference, and I think that’s why everyone loves it so much. Not to mention I finally got to meet folks I’ve been talking to on Twitter for two years! What role(s) do manipulatives play in learning mathematics? What role does the body play in learning mathematics? What does it mean to use manipulatives in a meaningful way? How can we tell we are using manipulatives in a meaningful way? I specifically say we began to explore these four questions because I don’t feel that we came to any solid conclusions, and that’s okay! Math in Your Feet leads students through the problem solving process of creating their own dance patterns. Along the way, they increase their understanding of mathematical topics such as: congruence, symmetry, transformation, angles and degrees, attributes, pattern recognition, symbols, and mapping on a coordinate grid, as well as deep experience with mathematical practices. The mathematical content of all activities was developed in collaboration with award-winning math education specialist Jane Cooney. One thing that I really like about Math In Your Feet is that it happens at the intersection of math and dance. It isn’t just math and it isn’t just dance. It makes me wonder what other art forms and activities intersect with mathematics, and it makes me wonder how we can leverage that in our teaching. I think this is important because working in these intersections makes math meaningful. It provides an authenticity to the work teachers and students are doing in the classroom by blurring the lines between “school” mathematics and, for lack of a better term, actual mathematics. If you want to see some of our work during these morning sessions, I recommend reading the Storify that Malke put together. You can also read her recap of the #BlueTapeLounge, the impromptu math and dance work that continued in the evenings in our hotel lobby. As for the four questions we started exploring, I’m going to come back to them in future posts. My thoughts on them are still churning in the back of my mind, and I want to take some more time to reflect on them. This entry was posted in Uncategorized and tagged dance, embodied mathematics, intersection, Manipulatives, Math In Your Feet, TMC on August 4, 2014 by bstockus.